One of my favorite quick and easy lunches to make is Dipping Strips Pizza. It requires 4 simple ingredients and takes less than 15 minutes to make. Perfect for a quick lunch in between all those summer-fun activities. Works for me! 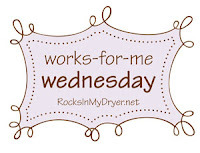 Check out tons of other recipes at Rocks in My Dryer... this week's Works For Me Wednesday theme is 5 ingredient or less recipes! Yum! I love pizza and this is an easy recipe. Have a nice week! This sounds divine! Pizza is one of my favorite foods, so I'll have to try this recipe. Thanks for sharing!